The PPI-200, designed to accept sheeted dough products from a makeup line or cutting table, provides a vertically integrated packaging system at an entry-level price and is an ideal fit for phyllo dough, cobbler crusts, pie crusts, and much more. 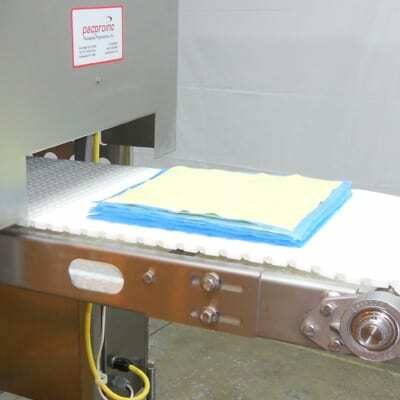 The Pacproinc® PPI-200 interleaver automatically places paper, film or foil under your raw dough product. In this way the system improves freeze release, ease of preparation, sanitary handling, shelf life, portion control, separation, and package presentation. All of our solutions are available as a combination interleaver and stacker or as standalone components designed to fit your application. The PPI-200 product line is a sanitary, washdown-duty, stainless steel system. The streamlined design incorporates leading-edge Programmable Logic Controller (PLC) and servo motor technology, ensuring low maintenance and a long machine life. With compact designs available, the PPI-200 requires a minimal amount of floor space and is engineered to exceed the American Meat Industry’s 10 Principles of Sanitary Design. Sheeted or pressed dough discs are aligned, interleaved with film, counted and stacked. This is a fully automated solution that requires no labor. Pacproinc® Interleavers and Stackers offer quick justification. Ground and polished welds further eliminate bacteria harborage points making cleaning to a microbiological level possible. All control cabinets and enclosures have sheet metal breaks eliminating the possibility of standing water on flat surfaces. We use sealed stainless steel bearings in all food-contact areas to prevent product contamination and offer optional, antibacterial belting.